Actor couple Shoumo Banerjee and Swaralipi Chatterjee share behind-the-scene action of making of Abar Baithak. Abar Baithak (meeting again) is one of the most happening hangouts in South Kolkata now. Unlike many other popular city-cafes the crowd in Abar Baithak seems to have no age barrier at all. Besides, serving good food and quality beverages the hospitality offers by the café is outstanding. The owners of it, Shoumo Banerjee and Swaralipi Chatterjee, two known faces of Bengali television, are always there to greet visitors with a warm smile. Now the obvious question is what two popular actors are doing with a café! Where the idea came from! And what on earth has gave them the courage to try luck in such an unknown trade, giving up quite successful acting careers behind! The answer perhaps lies in the duo’s passion for good food. “The idea came out of boredom of doing stereotype roles in television continuously” Shoumo shared. The duo was looking to do something of their own to make their individuality acknowledged. 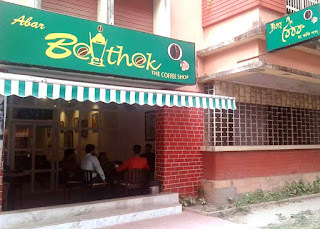 Initially, they opened a café, called Baithak, at Rajani Sen Road in 2012. Rajani Sen Road was made famous by the great Satyajit Ray himself. Ray’s immortal fictional detective character Feluda used to reside there. Baithak became a popular joint as soon as it was opened then. Being inspired by the idea of running a café in the name of Sherlock Holmes at the 22 (1B) Backer Street in London, the actor couple decided to do something similar in Kolkata with Feluda. The interiors were designed cleverly, offering a tribute to the great Bengali detective character. Unfortunately, the café could not sustain long. But the duo was in mood to give up their dream. 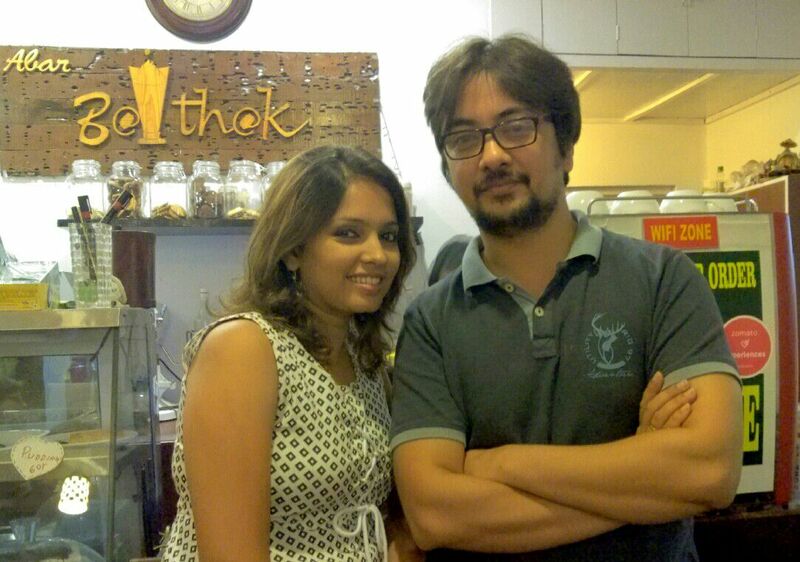 After a few years the couple opened Abar Baithak at Jodhpur Park with a bigger space and a better ground work. The duo is thoroughly enjoying the job. Shoumo is treating customers with his innovative cakes and Swaralipi looks after all the nitty-gritty to provide ‘the best service’ to all. The two often admit that they do miss acting but are not ready to do daily soap drama anymore. Why would they! The taste of individuality is much more alluring than any petty melodrama. Every Sunday, Abar Baithak hosts small cultural programmes. The range is quite wide. It varies from storytelling sessions to music concerts. Shoumo has revealed that they have been planning to host a small session to celebrate birth anniversary of Agatha Christie in September. The café displays and sells books as well. Swaralipi said, “surprisingly, here people look to buy more Bengali books than English”. The café owners also created a small space to exhibit art works and paintings too. Overall Abar Baithak has come up as a milieu of people with varied interests. They can play indoor games, read books or just sit and enjoy themselves. Shoumo’s continuous experiment with food and Swaralipi’s friendly chats are there to make one feel at home. The couple is known for not disappointing the visitors. In a long interview with Aitrayee Sarkar they proved that again. Listen to believe.